To log-out tap on the 3 bars at the top-left of the screen then tap on Settings and on the next screen tap on ‘Remove my Xpressions Account’ and then on Logout. Once logged-out and the app is installed please log-in again. 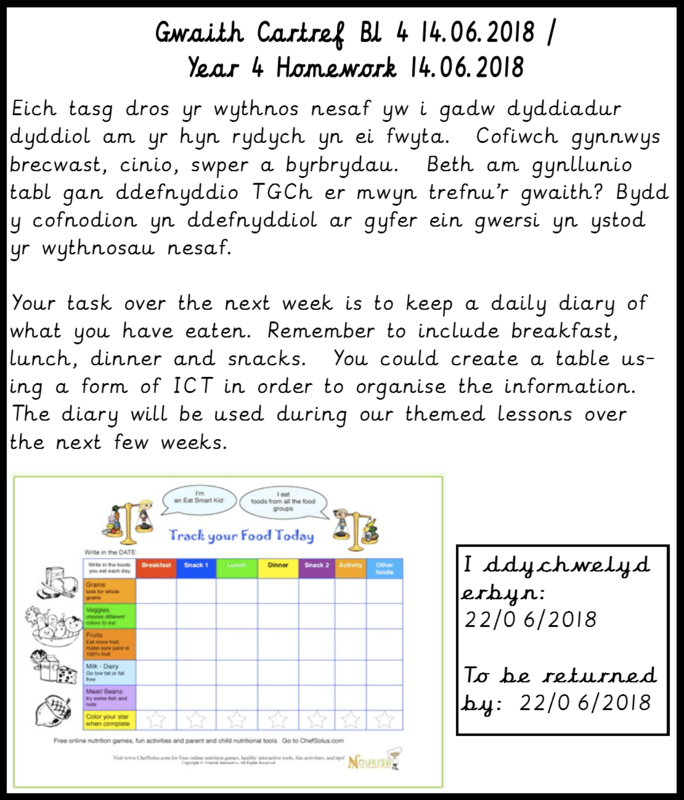 To create an online quiz using j2Vote on Hwb – use j2Vote to create a quiz for your friend about food – further details are in the homework book. To continue to learn the recitation piece for the Eisteddfod. As part of our theme ‘Castles and Dragons’ we are looking at aspects of Welsh castles. We are keen for you to prepare a presentation on Welsh Castles to the class. Before you can complete any presentation, you need to research and collate information. We would then like you to prepare a 2-3 minute presentation on a Welsh castle. The presentation can be a power point presentation, Key note or any other form that may be appropriate. Remember- the focus is on your presentation skills so practice beforehand and keep it simple! It will need to be completed and presented in Welsh! To use graphs, images and drawings that may be appropriate. To use correct grammar and vocabulary. Who built the castle?/ Who lived there? Type of castle? (Motte and Bailey/ Concentric/ Stone Keep Castle)? What materials were used to build the castle? – Why not save /upload your PPoint to your HWB page? – Why not e-mail it to your Hwb e-mail? Safer Internet Day (SID) 2018 will take place on 6 February 2018 with the slogan ‘Create, connect and share respect’. SID is a global celebration of the opportunities the internet has to offer and a day to open a conversation about how the internet can affect everyone, from children and young people to older generations. What does the competition in 2018 involve? Your entry must be an original creation from beginning to end. Entries can be in either Welsh, English or both. Art – A passionate Picasso? You can submit a drawing, sketch, collage or comic strip that you have created. Entries will be judged by our digital leaders.